I confess: 2016 was not a great reading year for me. Settling into a new job, traveling frequently—not to mention living through the U.S. election season!—made me retreat into videogames and the comforts of the suffering, over-handled paperbacks on my bookshelf. So in order to kick myself back out into the world of literature, I have two Reading Resolutions for 2017. 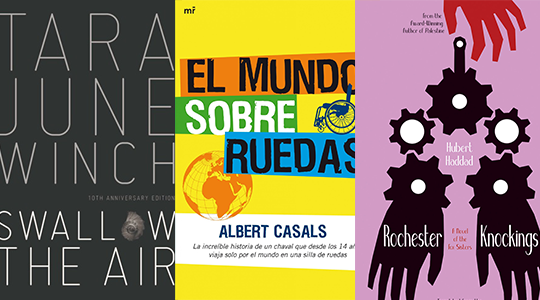 The first is to buy and read at least one book by an author from every continent, although since Antarctica is not awash in literature, Central America will be stepping in to play the role of the seventh. At a time when nationalism and xenophobia are rearing their ugly heads across the U.S. at an alarming rate, it feels more important than ever to remind myself of the incredible breadth and depth of international literature and to support the missions of the presses who publish and promote it by being an active consumer. 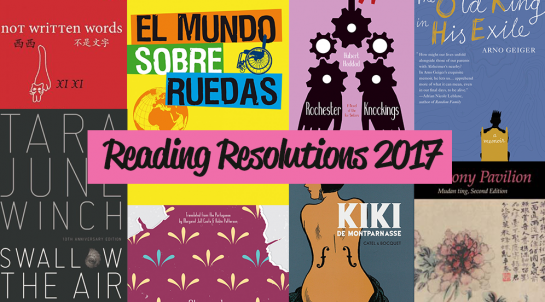 The second resolution is much simpler: to read at least one book in Spanish, because “rusty” is starting to become a generous description of my skill level. Luckily, I’ve got my Spanish-language, European title all lined up. 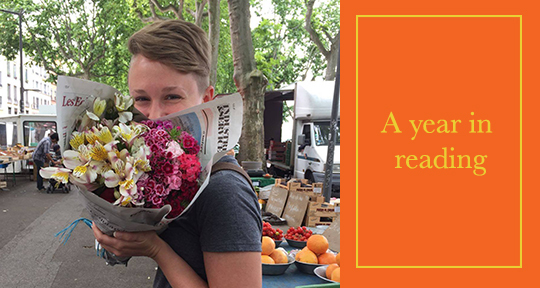 In Asymptote’s April 2016 issue, we published Close Approximations 2016 runner-up Ona Bantjes-Ràfols’s sample translation of El Mundo Sobre Ruedas by Albert Casals. As a sucker for travel narratives—and funny ones, at that—I was hooked. And since there’s no full English translation available, this is the perfect opportunity to work on my Spanish. Africa also already has a spot on the reading roster. When Rochester Knockings by Hubert Haddad (trans. Jennifer Grotz) came out in 2015, it jumped straight onto my ever-growing wishlist. Written originally in French by a Tunisian author, it concerns the Fox Sisters, fraudulent mediums and Rochester, New York residents. As a former student of the University of Rochester, where Open Letter Books is based, and a two-time former Open Letter intern, this one is right up my alley. Supporting a favorite indie press and getting to read about fake mystics? Win-win! Thinking ahead, I’m anticipating difficulties choosing an Australian title. Ideally, I would like to read something in translation from a native Australian language, but I’m having trouble finding something. Failing in that mission, I do want to read something by a native Australian author. As of now, The Swan Book by Alexis Wright and Swallow the Air by Tara June Winch have both entered consideration. 2017 should be a good year for reading. Two books picked out, five to go, and—sorry in advance for the cringe you’ll get out of this—a whole world to explore.